Who are the "Disciples of Christ"? Please take a look at the brief 10 minute video "A Movement for Wholeness" below to learn a little more about who we really are as Disciples. The symbol of the Christian Church (Disciples of Christ) is the chalice. Have you ever wondered about its origin? There are some who assume it was designed by our founders, Alexander Campbell and Barton Stone. But actually, the chalice symbol is a rather recent development. In 1968, after the General Assembly approved the restructuring of our church, an administrative subcommittee was charged with the task of coming up with an appropriate symbol to express our identity and purpose. More than 200 proposals were considered. Finally, over a January, 1970 lunch meeting at Stouffer’s Inn in Indianapolis, committee chairperson, Robert L. Friedly, and church consultant, Ronald Osborn, agreed that the communuion cup was the best symbol to represent the Disciples of Christ. They also agreed that the cup needed a cross, but considering over time several representations had been used, which one was most appropriate? Eventually, they agreed that the St. Andrew's X cross was the most emblematic as it not only paid tribute to the denomination's Scottish Presbyterian heritage but also represented the denomination's evangelistic emphasis. It was also decided to rotate the cup so that the X appeared as a guiding shadow. The new symbol immediately caught on and was officially adopted at the 1971 general assembly. The cup reflects the centrality of the Lord's Supper in Disciples worship. The red color of the cup symbolizes the life and vitality of the blood of Christ on our behalf. The white St. Andrew's cross represents the purity of spirit of those who follow Christ as well as the intentional fervor to lift up the name of Christ in both life and practice. Click below for the homepage of the national website of the Christian Church (Disciples of Christ). There you will find more information about the various ministries and programs of our denomination at the national level. Click below for the homepage of the Virginia Region of the Christian Church (Disciples of Christ). There you will find more information about the various ministries and programs of our denomination at the regional level. The Virginia Region of the Christian Church (Disciples of Christ) is divided into Eleven Districts. First Christian Vinton is just one of the eleven churches that make up District Three (III). District III includes nine congregations in the "greater Roanoke, Salem and Vinton metropolitan area" and two churches, Calvary Christian in Covington and First Christian in Clifton Forge which are several miles north and west of Roanoke in the Jefferson National Forest nearing the West Virginia Border. District III Churches are listed below. Those with websites are displayed as links to their sites and will open in a new window. ​First Christian Church of Vinton (Disciples of Christ) traces its roots back to 1910 at the Midway Union Chapel, a little white wood frame church on the corner of Seventh Street and Dale Avenue. Rev. A. J. Cochran, Sr. was minister of the Disciple group. Rev. D. S. Wohlford was called as the minister in March 1922. The group was reorganized at that time as an individual church with approximately 50 members and was named Midway Christian Church. They continued to meet at the Midway Union Chapel. In 1926, at the corner of Sixth Street and Vale Avenue, on land donated by the Lantz family, the church began a drive to erect a new sanctuary. On May 15th, 1927, the new brick structure, built at a cost of approximately $5,500.00, was dedicated. The dedication sermon was preached by the Rev. A. C. Meadows, then pastor of Belmont Christian Church, Roanoke. Also participating was the Rev. H. D. Coffey. Additions to the church include two additional rooms, a baptistery and central air conditioning. Beautiful stained glass windows adorn the sanctuary memorializing those who have worshiped at and served First Christian Vinton. February 15th, 1942 saw a name change to First Christian Church. In 1958 a foyer was added to the main entrance which enclosed the steps leading to the sanctuary and also provided a totally enclosed route to access the fellowship hall and lower level. In 2004 the sanctuary was remodeled with new carpeting, lighting, choir seating, handicap ramp and digital pipe organ as well as a new sound system. 2009 saw new replacement windows on the lower level, a new architectural roof and new commercial guttering. In 2010 a new chair lift was added to the steps in the foyer to make the sanctuary more accessible to the physically impaired. In 2011, we have continued to upgrade and maintain our physical plant, to make an attractive place for folks to come worship. In April, the foundation of the church was painted to more closely match the upper brick portion of the building. This replaces the old "battleship gray" color. The wood window trim around all of the stained glass windows scraped, primed and painted white. New Lexan covers for the stained glass windows were installed to replace the old, cloudy covers which were removed for the painting. The old covers were approaching 25 years of age and definitely showed signs of it, not allowing the true beauty of the windows to shine through. 2012 saw even more improvements. The fellowship hall was totally gutted and received new flooring, paint, improved restroom and kitchen facilities, updated plumbing. This was in addition to removing the center walls which provided more space for dinners and gatherings in the fellowship hall. A big screen television was installed in the fellowship hall to allow for slide shows, viewing the services in the sanctuary live and allowing the kids a venue to play Wii games. The concrete ramp leading to the rear sanctuary door was enlarged and wrought iron railings installed around it. The two doors leading from that ramp to the inside of the sanctuary were widened to 36" to accommodate larger wheelchairs and other mobility devices in addition to caskets in the case of a church funeral. This year also saw the implementation of recording our worship services for later broadcast on the internet via You Tube. In 2017 we installed a new Rodgers Insignia 577 digital organ. The organ is of AGO specification, Dark Oak with two 61-note Tracker Touch Manuals (or keyboards) and a 32 note Concave Radiating Pedalboard. 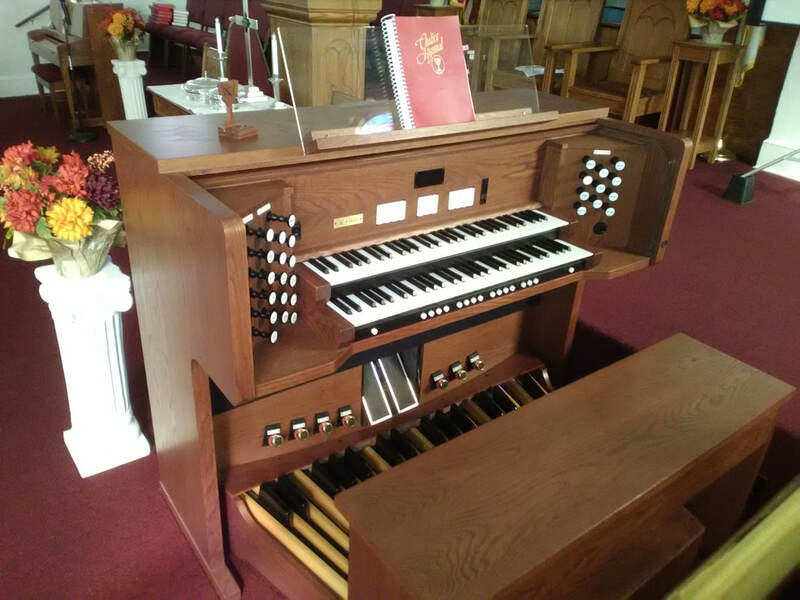 Features include: Silent, Lighted Drawknob Stop Controls - 37 Stops (or voices) with 10 of those being Voice Pallate Stops - 4 Organ Couplers and 3 MIDI Couplers - LCD Console Display – Split Expression Shoes or Programmable as Swell/Crescendo with Indicator – 7 Toe Studs (1-4 Memory, SW to PD, GT to PD & Tutti) – Tutti with Indicator – Transposer – Full Tuning Control and Note by Note Voicing – 8 General Memory Pistons X 4 Memory Levels (may be programmed as divisionals) – Eight Historic Temperaments - RSS Ambiance for Room Modeling – Four Channel Audio. 2018 Saw the installation of our new Young Chang model G-157 grand piano. 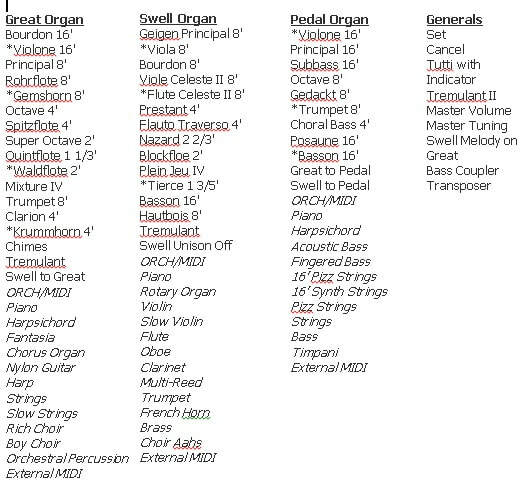 It is a wonderful addition to our music ministry. The tone and volume fill the sanctuary nicely. It is 5'2" in length and the finish is Walnut Polish. 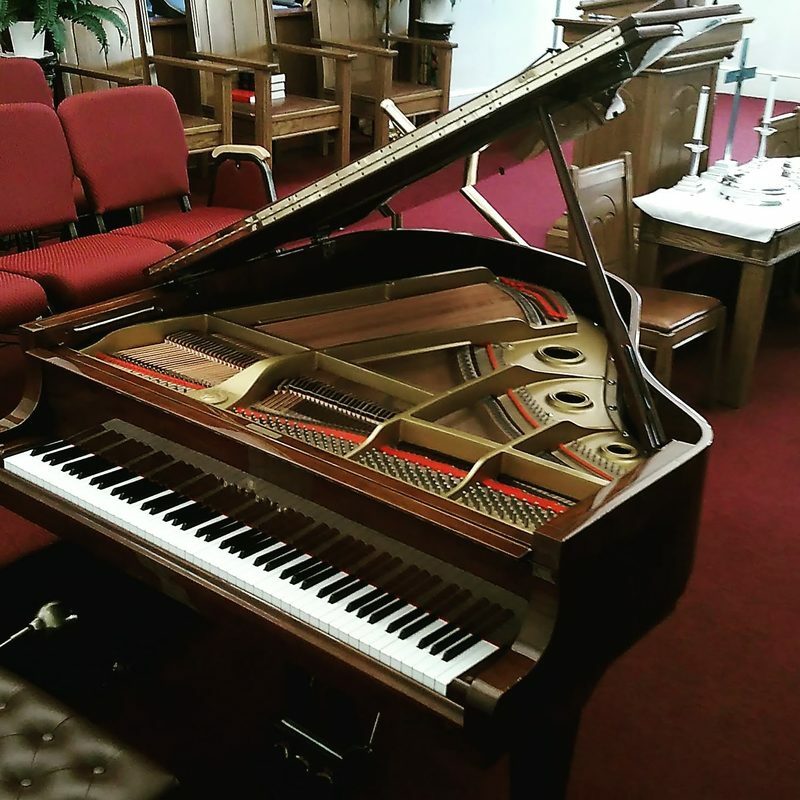 While it is wonderful to have a building to meet in and quality musical instruments to enhance our worship of God, the most important things are the things we do to reach out to others in the name of Christ. Over the years FCCV has been the recipient of the Excellence in Evangelism Award from our denomination for the most baptisms in ratio to membership. This is a direct reflection of our members enthusiasm for bringing others into the family of Christ. We continue to reach out to our community and beyond as we support local missions such as the Second Harvest Food bank and Roanoke Rescue Mission. We also conduct community Backyard Bible Clubs for the kids in the MIdway neighborhood, collect school supplies for Herman L. Horn Elementary School, receive special offerings for natural disaster relief around the world and many other projects that help us "love our neighbors as ourselves".